Two movies opened recently that allowed, in a rare instance, the ability for filmgoers (at least if you live in the LA area) to actually see all the foreign language films nominated for an Academy Award before the ceremony. However, taken together, Colombia’s Embrace of the Serpent and Denmark’s A War, are a mixed bag as far as I’m concerned. 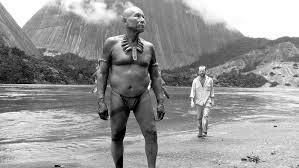 Embrace of the Serpent, written by Jacques Toulemonde Vidal and the director Ciro Guerra, is based on the diaries of the two Europeans whose trips up the Amazon are dramatized here: Theodore Koch-Grunberg, who traveled the river at the turn of the 20th century, and Richard Evans Schultes, who did the same about fifty years later. The conceit is that the same guide, Karamakate, led them both, and both explorers had the same goal, to find a sacred plant that is supposed to be some sort of wonder drug. The story is the usual one of how Europeans exploited the indigenous people and how foreigners destroyed their way of life. As such, it gets the job done. At the same time, as righteous as the filmmakers are in their analysis of the situation, I felt that the themes were a bit too much been there, done that, as was the basic plot. It’s basically Joseph Conrad’s Heart of Darkness redux and doubled, as two men travel up a river years apart taking in the often nightmarish sights (all the result of European colonialism). But it’s not Colonel Kurtz (or his doppelganger Marlon Brando) that the explorers are looking for, but the aforementioned plant. The characters are satisfactorily played, but they are not that interesting. Some of their stops along the way fare much better, especially one where the locals have taken Christianity to a degree that could be the definition of over the top, and one where they land at a Westernized village under attack by a Colombian army. 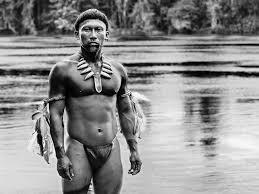 And it must be said that the movie is absolutely gorgeous with striking black and white photography by David Gallego. But for me there is just a bit too much of a new age approach to portraying the native tribes. I have no issue in going after Christianity, it certainly has more than its fair share of faults and gets whatever it deserves here. But I find myself distrusting a movie that then promotes the local religion as sacrosanct. With Jan Bijvoet, who gave a riveting performance in the quite riveting Borgman, as Theodore; Nilbio Torres and Antonio Bolivar as Karamakate, young and old; and Brionne Davis as Evan. In the movie Captain Phillips, by writer Billy Ray and director Paul Greengrass, Tom Hanks starred in the title role, playing the captain of a ship that was hijacked. The same year from Denmark, writer/director Tobias Lindholm gave us A Hijacking, also about a ship that was taken over by pirates. Both were outstanding pictures of their year, riveting, powerful, strongly written with complimentary direction. Yet both couldn’t be more different. Captain Phillips was more of a Hollywood tent pole film (though the film rose far above that), big, impressive, full of action. Everything was clean and focused. You could see where the money was spent. The sort of film that shows what Hollywood can do when it’s actually trying to do something. Meanwhile, A Hijacking was more new wave and indie in feel; even more of a procedural as to what happens when a ship is taken over by pirates and that ship is not from the U.S. 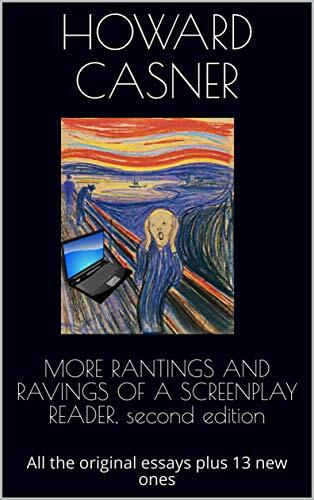 It looked a bit ragged, the story took its time to tell, a slow burn of a movie with little of the pomp and circumstance that often comes out of Hollywood. And it was still as exciting as any tinsel town blockbuster. I mention this because Lindholm’s new film, A War, takes the same slow burn and realistic approach. It’s a war movie, but the filmmaker lets the story tell itself without forcing it, Again, like A Hijacking, it at times feels like more of a procedural that a typical war film. This is not the only aspect that makes A War different from other films like it. It’s structurally non-traditional as well. 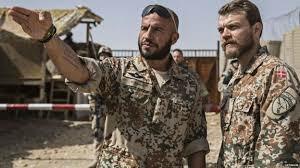 Here, the inciting incident doesn’t take place until about half way though when the central character Claus Pederson, the commander of a military unit in Afghanistan, and his men get caught in crossfire while patrolling a local village. He calls in missile support and bombs the village, resulting in the death of civilians. Not long after he returns to the base, he is put on trial for war crimes. The movie might even be called a before and after picture. 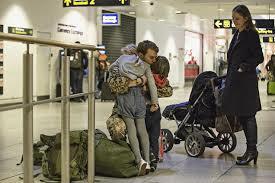 Before the attack, the movie is a naturalistic look at the day to day routine of soldiers in policing a war zone; this is intercut with a realistic look at Pederson’s wife back home who is raising three children, one of whom has begun acting out as he comes to understand why his father keeps leaving home. There’s no real central melodrama, no overall conflict driving the story, no attempt to make more of the situation than it is. This is especially true of the approach to character. Often in creating a story like this, the filmmakers try to give personalities to the individual soldiers, with the result that they never really come to life, but often come across more as one dimensional types with little, if any, depth. Lindholm never remotely tries to give his characters something that isn’t there, but just lets them be who they are. The result are characters who are for more interesting and three dimensional than in such films as Saving Private Ryan and Blackhawk Down. In the second half, or the after part of the story, is a dramatization of Pederson’s trial where the prosecuting attorney accuses him of unnecessarily calling in air support even though he didn’t really know if they were under enemy fire or not. As riveting as this second half of the film is, Lindholm may not be playing quite fare here. Since we were with Pedersen during the incident, we know that even if he did misjudge the situation, he was righteous in his call because he really believed his men were in danger. We also have seen how dedicated and fair-minded he has been as a commander. The danger here is that the movie may be coming too close to the idea that every accusation of a war crime is a disservice to the soldiers. But history tells us (especially when it comes to such conflicts like Viet Nam) that war crimes do happen, sometimes by the “good” side as well as the “bad”. But here Lindholm tends to summarize the idea by giving the prosecuting attorney a supercilious smirk and condescending looks. Still, A War is a fine film that is powerful and challenging. 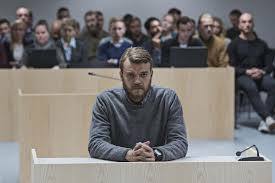 With Pilou Asbaek as Pederson (Asbaek played the main character that was hijacked in Lindholm’s earlier film); Soren Malling (who was the company’s chief hostage negotiator in A Hijack) plays Pederson’s defense attorney; Tuva Novotny is his wife; and Charlotte Munk provides the smirk as Pederson’s prosecuting attorney. Lindholm is quickly becoming one of Denmark’s top filmmaker. 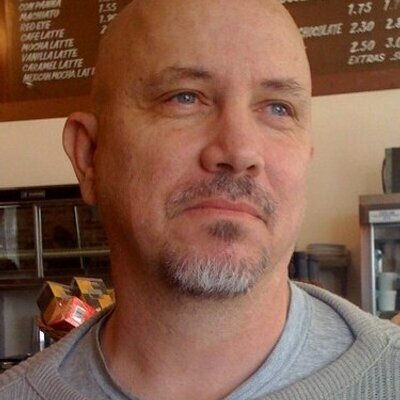 As a writer he worked on The Hunt and Submarino and now tends to write and direct his films.